Day 2 should have seen the rest of the Olympic classes joining the 49er, 49erFX and Nacra17 fleets who started racing Monday. 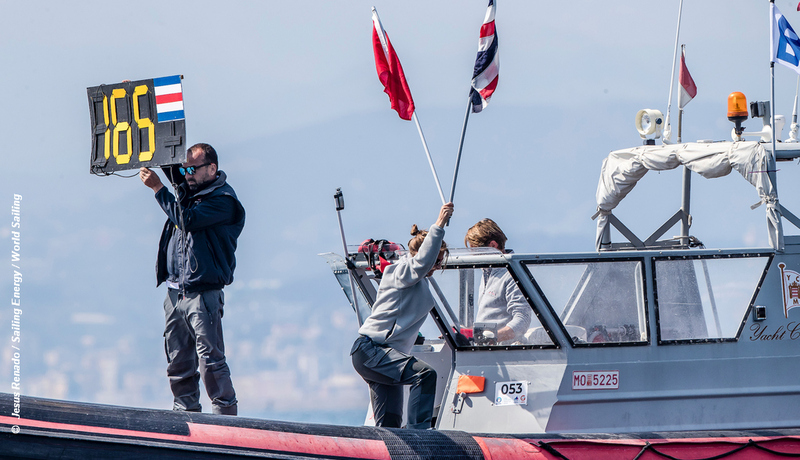 But the Italian city was hit with a light 5-6 knot wind which meant that the split Laser fleet could only complete one race apiece, and only the 49erFX blue fleet were able to complete a race alongside the Lasers. Of the British Laser competitors, Dan Whiteley was 12th, Joseph Mullan 16th and Sam Whaley 24th in their flights. Denmark’s Ida Marie Baad Nielsen and Marie Thusgaard Olsen claimed the 49erFX victory. They finished ahead of Italy’s Carlotta Omari and Matilda Distefano and Spain’s Tamara Echegoyen and Paul Barcelo Martin. Martine Grael and Kahena Kunze of Brazil who were in 2nd overall, finished fifth, so should maintain a leading group position. Ireland’s Olympic silver medalist Annalise Murphy, now competing in the 49erFX with Katie Tingle, finished 16th in that race, they have a 21 and 5 from their earlier two races. None of the FX Brits were racing. The result has not yet been applied to the overall leaderboard as the 49erFX yellow fleet need to complete their third race of the series. The Good Times are Back - Watersports participation is on the rise!